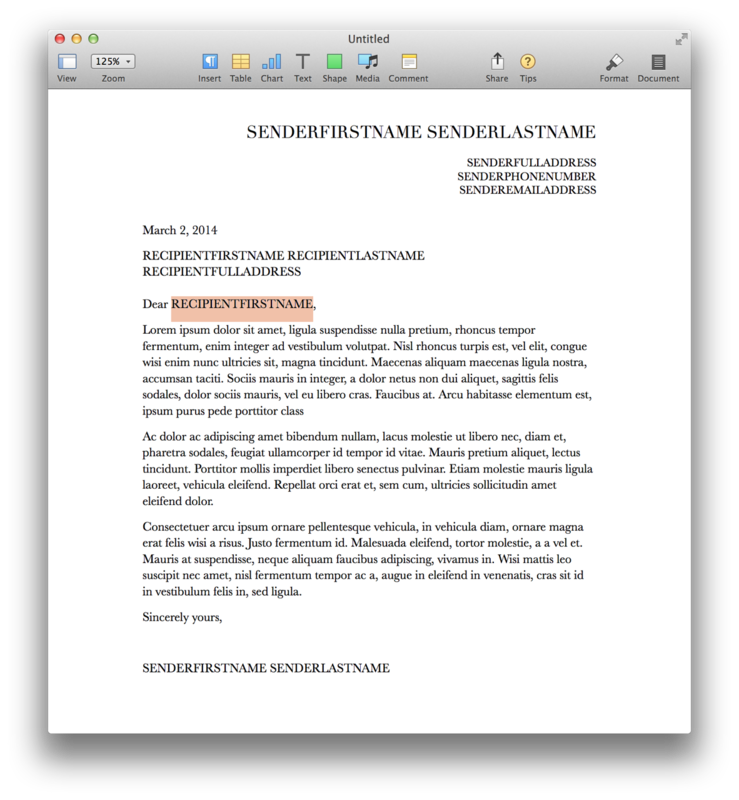 Here’s a powerful example of AppleScript automation, involving three OS X applications: Contacts, Pages, and Mail, that will create and mail encrypted PDF files generated from a Pages template containing text placeholders. This Mail Merge example uses the people of a chosen Contacts group as the source for the placeholder replacement data. If your target contact information is in a spreadsheet or other data container, read this page containing simple instructions for easily transferring contacts from other data sources into the Contacts application. 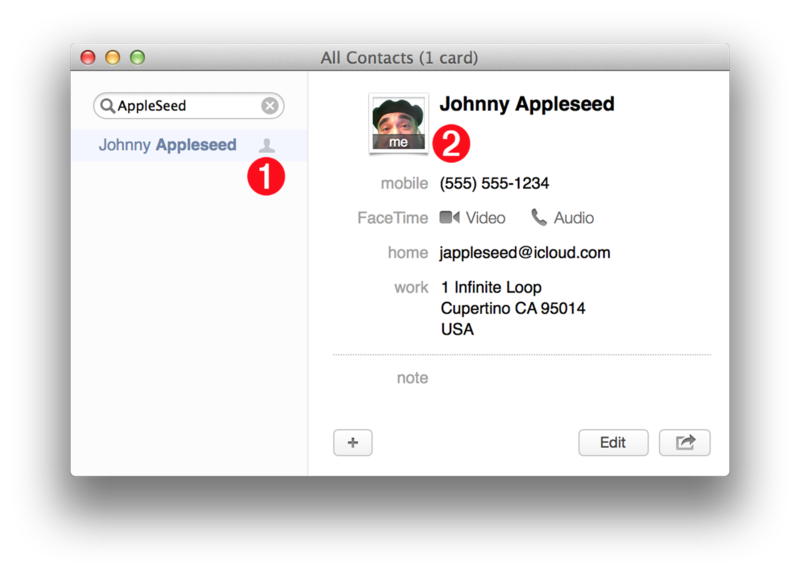 DO THIS ►In the Contacts application, create a default card containing the Mail Merge sender’s data. Include First Name, Last Name, eMail address, Mailing Address, and Phone Number. Make the card the default card by choosing Make This My Card from the Card menu. DO THIS ►For testing the script, create small Contacts group containing four to five people. The data requirements for the recipient contacts are: First Name, Last Name, and eMail Address. By default Mailing Address is optional for recipients. Individual Contacts entries with incomplete required data will be skipped. (⬇ see below ) An individual from a Contacts group. This recipient’s record contains all of the required (mailing address is optional) contact information. Naturally, this script is meant to work with your own templates. But you should try it once with the provided example template, to become familiar with how it works. DO THIS ►DOWNLOAD, open, and install the example Pages pre-tagged template. The template contains text placeholders that will be located and replaced by the script using contact information from the individuals in the chosen Contacts group. Here’s a script for performing a mail merge with a Pages document. NOTE: The default set of text placeholders used by the script, such as SENDERFIRSTNAME and recipientLastName, can be customized by editing the properties at the top of the script. The only requirement for their design, is that a placeholder must be a unique continuous string of text characters, not found as part of other words, and that a placeholder not contain spaces, numbers, hyphens, punctuation, or word delimiters. DO THIS ►Open the script in the AppleScript Editor application and run the script. Follow the prompts and instructions. TIP: If you want to use this script often, install it into the system-wide Script Menu. The script offers an AUTO-SEND option to automatically send the generated eMail messages once the processing has completed. 02 property senderFirstNamePlaceholder : "SENDERFIRSTNAME"
03 property senderLastNamePlaceholder : "SENDERLASTNAME"
04 property senderEmailAddressPlaceholder : "SENDEREMAILADDRESS"
05 property senderFullAddressPlaceholder : "SENDERFULLADDRESS"
06 property senderPhoneNumberPlaceholder : "SENDERPHONENUMBER"
08 property recipientFirstNamePlaceholder : "recipientFirstName"
09 property recipientLastNamePlaceholder : "recipientLastName"
10 property recipientFullAddressPlaceholder : "recipientFullAddress"
22 set autoSendState to "OFF"
24 set autoSendState to "ON"
120 set errorNumber to "NO DEFAULT CARD"
122 "No person in this Contacts database is set to be the default card or “My Card.” Select a person and choose “Make This My Card” from the Card menu." 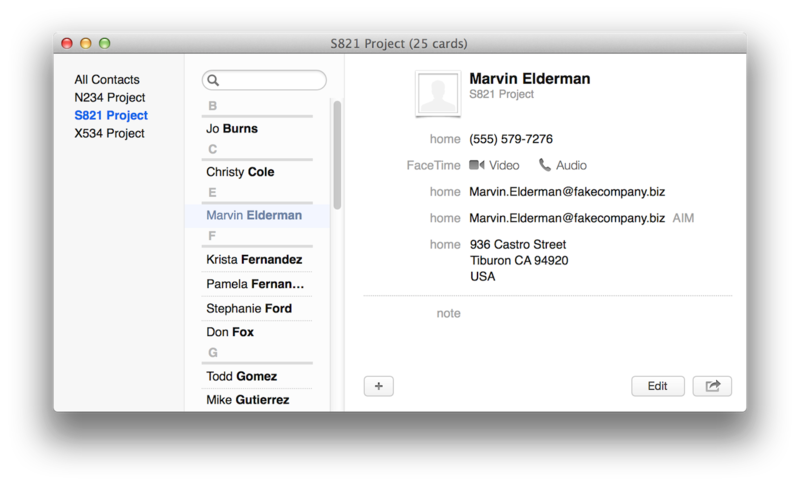 125 set errorNumber to "MISSING SENDER INFO"
127 "The current default card is missing a value for the First Name or Last Name fields." 130 set errorNumber to "MISSING EMAIL ADDRESS"
132 "The current default card is missing a value for the email address field." 135 set errorNumber to "MISSING MAILING ADDRESS"
137 "The current default card is missing a value for the address fields." 140 set errorNumber to "MISSING PHONE NUMBER"
142 "The current default card is missing a value for the phone number field." 144 set errorNumber to "MISSING GROUPS"
146 "There are no groups in the current contact database." 148 set errorNumber to "MISSING PEOPLE"
150 "The chosen Contacts group contains no people." 170 set userTemplateNames to the name of every template whose id of it begins with "User/"
181 display dialog "Enter the name to use for the exported document:" default answer ""
185 set exportDocName to thisDocName & ".pdf"
241 set the errorLog to "MAIL MERGE ERROR LOG"
252 set recipientFirstName to "NO-FIRST-NAME"
261 set recipientLastName to "NO-LAST-NAME"
271 set recipientFullAddress to "NO-FULL-ADDRESS"
280 set recipientEmailAddress to "NO-EMAIL-ADDRESS"
365 display notification "Process completed." with title "Mail Merge with Contacts Group"
369 set errorNumber to "OPEN DOCUMENTS"
371 "Please close all documents before running this script." 373 set errorNumber to "NO USER TEMPLATES"
375 "There are no Pages user templates installed on this computer." 377 set errorNumber to "MAIL MERGE ERRORS"
379 "The open document lists the errors occuring during the Mail Merge." 383 display notification "Errors occured." with title "Mail Merge with Contacts Group"